The night before the race Matt (who also ran it) and I carb-loaded up the wazoo at Gennaro, an Italian place uptown that we’ve been meaning to try. I ate so much. The morning of the race, I woke up from a 4:45am alarm. Still full from the night before, I had an English muffin and some water. We met our friend Nina at the subway at 5:40am and boarded a downtown train already packed with runners. This is what I was so happy to be a part of, and when I felt like I missed out on during my series of ankle injuries. This incredible, intense, rise-before-dawn group that chooses to run before most people choose to wake up. We got to the start and the bathroom lines were already very long, but at least they were inside the corrals. I said good bye to Nina and Matt and we found our assigned corral. I waited in a long line to use the porta potty (ugh). I was in good spirits, chatting up all the strangers around me. I bopped along to the pre-race music. I was genuinely excited to be there and to be a part of this huge, happy event. When the starting gun fired, it took about 8 minutes for my corral to cross the starting line. I had no idea what to expect out of myself for this race. My longest run in about a month was 7 miles, and it was terrible. There are some hills in the park, and they aren’t Harlem Hill-steep, but they are hills. Ocean Parkway is a decline the whole way through, but I found that a bit tough. It’s not such a steep decline that you’re speedily pushed forward by gravity, it’s so slight that it hurt my quads, since my legs haven’t run at that angle for 6 or so miles before. I actually found it really hard. Mentally, the last few miles of the race were tough. Running 10 miles is triumphant, and I can stay happy the whole time. Those last 3 miles, you are so close to the finish seem somehow longer and more trying than any other part of the race. Somehow, they were also my fastest. At this point I let loose. I didn’t hold back and was motivated by the excitement of being done. I also knew I had a chance of beating my secret, never-before-mentioned on this blog race goal. The last moments of this race are on the Coney Island boardwalk. I didn’t realize only the last 400 meters were on the boardwalk til I ran this race. When I spectated it, I assumed the runners were on the boardwalk for a while. I crossed the finish line at 1:56: 23. Finishing the race with an average page of 8:53min/mile and pleased as punch. My ankle, my hips (and my spirit) all held up for 13.1 miles and I couldn’t be happier. Did anyone else run the Brooklyn Half? Another question: I typically NEVER mention pace or speed on this blog, because that’s not the point of it. I know many people are faster and many people are slower, and for me, Cuckoolemon is about an active lifestyle, trying new things and comparing yourself to other people often hinders a willingness to try. But meeting a goal is an important part of this story (for me). Do you want to know my speeds? Or should I keep them to myself? 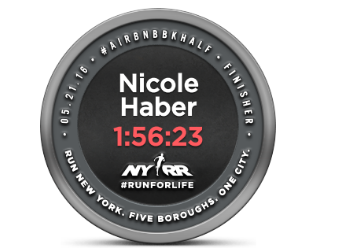 Savvy readers know my race times (and everyone’s) are always available on the NYRR website. Thoughts? Feelings? Congrats! I ran the BK Hlaf too. The race was a bit tough on me too because I found it too humid at the start of the race and I raced a half last week, so I wasn’t fully recovered. Personally, I like reading paces and times in a recap. You certainly don’t need to declare a time goal before the race (I rarely do myself), but I like giving all the info afterward in a recap because months/years later, I find the info helpful when I’m assessing how training went. Two halves in two weeks! That’s alot! Congrats on finishing. Thanks for your feedback on the paces. I appreciate it. Wow great job finishing a race with little training!!!! SO happy for you!!! I do like seeing the times, mostly because I want to know how everyone paces. Plus, I do it as it makes me really accountable. I started blogging only because i kept making the same mistakes over and over, so when you have to analyze what you did (for the post) it helps you learn for the next one. at least that’s why I do it! hope you’re back to super fitness in no time!!!! I will say when I miss my goal I do think about how I “have to” post my failure. Overall I am always interested to see how training works for others to achieve their goals! Thank you so much. I really appreciate your perspective. congrats on the race! Thanks for mentioning me! Congrats!! You did AWESOME!! Especially considering your longest run in weeks was 7 miles! thank you. maybe that’s the TRICK? !